A ‘stepping stone’ piece that came out of a year of experimentation. A painting about organization. And then the organization is visually redacted - broken, disrupted and obfuscated. It is a cover-up of what went before. A trickster. A bamboozler. In a home renovation when you remove a wall, a trim board or a shelf - old colours are revealed speaking of past histories. The layers of colours describes the occupants. 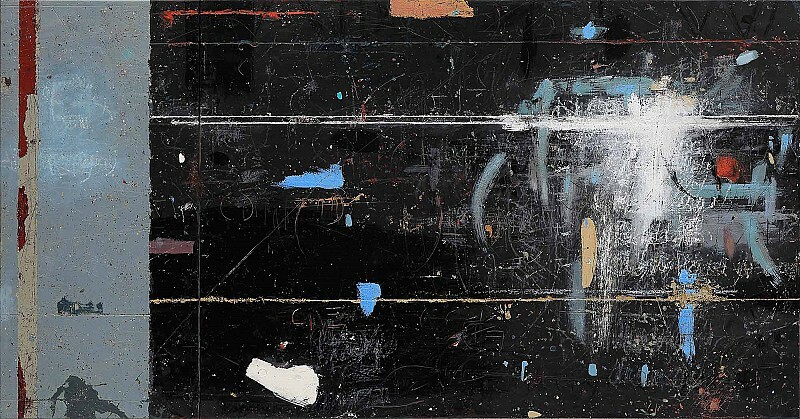 This painting is both a measurement of time and a time capsule. Bold and in your face - but restrained and hidden with something covered over, eradicated and partially seen. Zeppelin-like wireframe shapes - symbols of science and knowledge - are presenting themselves in my recent artwork. Fragments of knowledge - buried, hidden and obfuscated - are revealed through partially excavated layers. We are in an age that could be overwhelmingly perceived as magic. We live in a modern era full of technological marvels that provide reality to anything we can dream about. We can effortlessly fly through the air. We can create objects out of seemingly nothing. We can communicate in real time anywhere in the world. Complex calculations are achieved in a fraction of a second. Deep and complex knowledge is literally at our fingertips. It is a world spurred on by invention. A message of hope, dreams and perseverance. Any previous stage of human history would view today’s technology as magic. Through science and technology we build on the success of others. In our ancestor’s concept - we are living their future with magic. “Squirl & Mimsy” is about differences. One side is light and bright with a geometric flourish scrolling over the panel and partially being obscured. We are attracted by the colours and shapes. The other side is quiet with subtle elements floating across the panel. Close observation will reveal intimate marks and details within the dusty green and aubergine areas. Inspired by a parkade post in old Quebec City. Signage has come and gone. The overwriting. The obliterating of communication. The mindless utilitarian obfuscation. The past is history. The future is for deciphering. “Boom Shak-a-laka” is a visual interpretation of visual or auditory patterning. The big picture is a controlled cadence of light and dark value is disrupted with texture and colour - adding character and depth within the beats of the sequence. 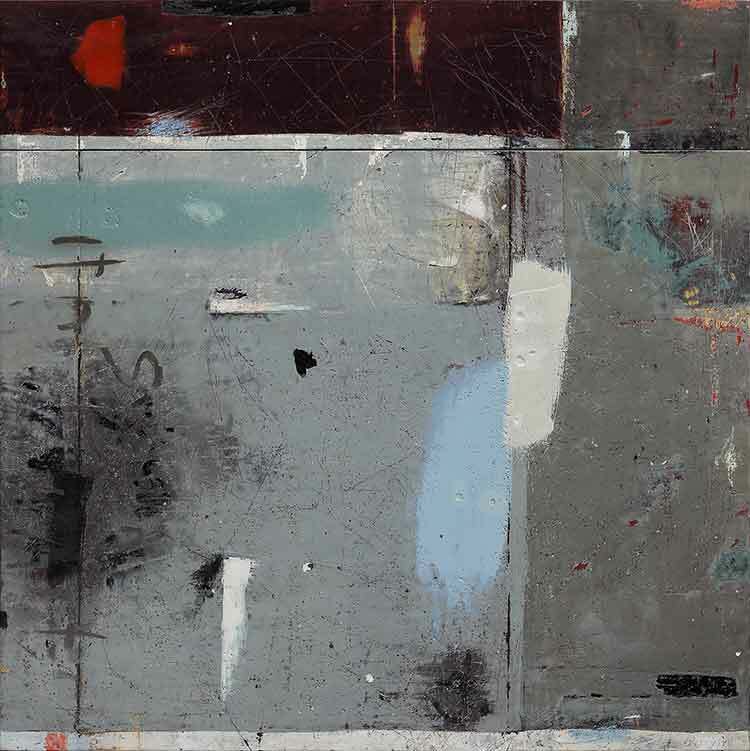 An intimate observation of the painting’s surface reveals the subtle variances and textures even within the quiet areas. 61cm x 152cm/ 24" x 60"
Inspired by industrial technology, this piece suggests a rhythm of velocity industrial rough edged music/ sound… perhaps from a tanker, a ship or jet of some kind.The rhythm of multiple staged bands of colours are orchestrated across the surface create a sinusoidal wave feeling. In reference to the school room where the students would become educated. The painting suggests a school room blackboard and elements of writing on the board. It also suggests schoolroom antics of drawing on the chalkboard and being erased. Note: ”Send in the Clowns” is a song written by Stephen Sondheim for the 1973 musical A Little Night Music. It had a nicer ring than ’send in the fools’. 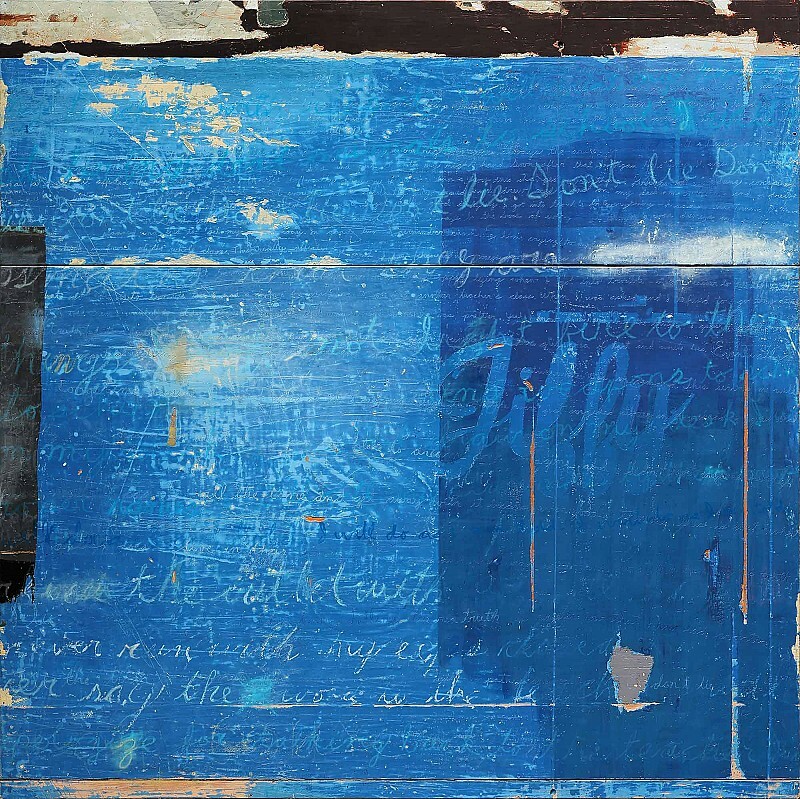 Inspired by the forgotten classroom walls and blackboards… and the desire to create ‘a big blue painting’. The writing is partially student graffiti and over remnants of teacher’s daily instruction. In the end the artwork became a personal piece with observations and revelations. In fine detail there is a quiet confessions scribed into the surface. Everything was once shiny and new - full of promise and expectations. Old and beaten up. Repaired. Obscured. And then lost. Does the promise still hold true? One child in every class is the ‘Whiz Kid’. Sometimes the anointed child will falter and fail. Sometimes the whiz kid will shine through and champion thinking and thought. Inspired by industrial technology, this piece suggests a rhythm of velocity and industrial rough edged music and sound. The cadence of music is achieved through the spacing of colour and lines. The passing of time is expressed by a textural surface and lost typography. Build. Repair. Repurpose. Growing up, I came to know many items that have outlived their intended usefulness. With a combination of ingenuity and frugality, the repurposed items became a happenstance creation. I was struck and influenced by the industrial beauty of an old quonset shed in Saskatchewan - it was fun and nonsensical due to accident and chance. Inspired by a broken interior wall in an abandoned school house on the Expanse townsite in Saskatchewan. If walls could talk… would the wall speak of world knowledge or classroom antics? Like dandelion seeds to the wind, the Expanse students travelled into the world. What differences did they make in the world. Did they make it better? Did the school do its job? Did the students do theirs? “Make Me Proud”. Possibly the last words of encouragement the wall communicated to its students as it sent them out into the world. You win something. You lose something. Two steps forward. One step backward. This piece suggests visual music. A drumming beat is set up by the dark and light staged sequence of the background bars. And then a haphazard, aggressive and perhaps playful disruption is applied to the sequenced beat. Within the background beats is subtle complexities within the light and dark areas. 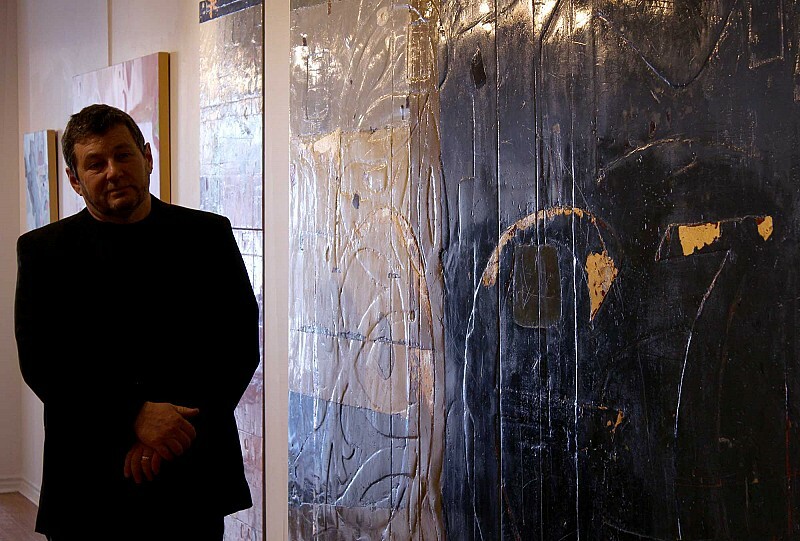 Kevin Ghiglione, a Saskatchewan born and now Toronto-based painter, brings decades of his art making experiences to his painting. He uses a mixed medium approach. One of the mediums is the ancient encaustic medium. 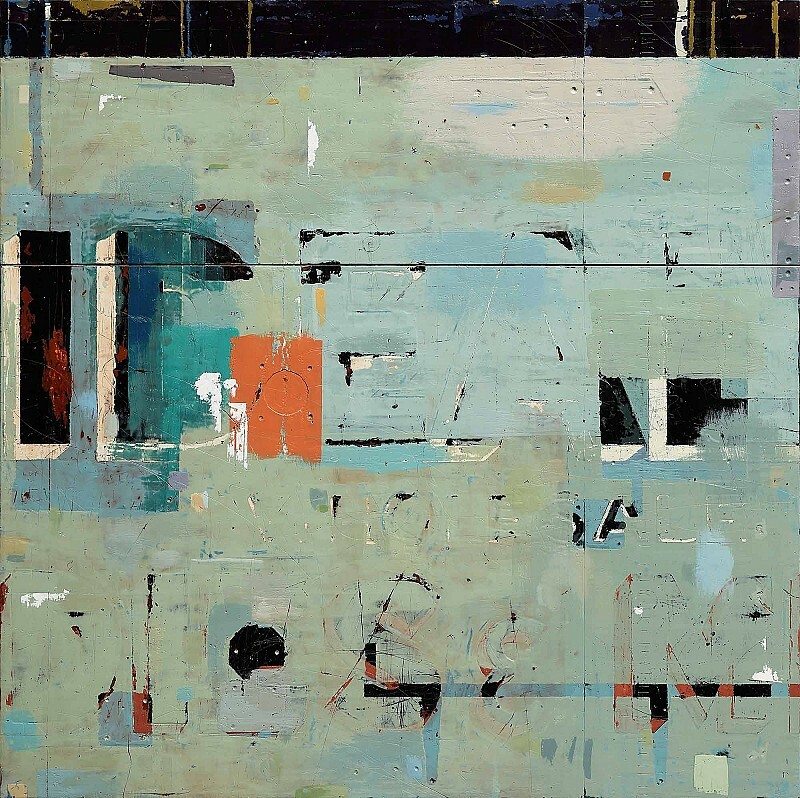 His paintings are abstract construction projects, “buildings” of many dimensions and layers on which he uses composition, colour, and texture. 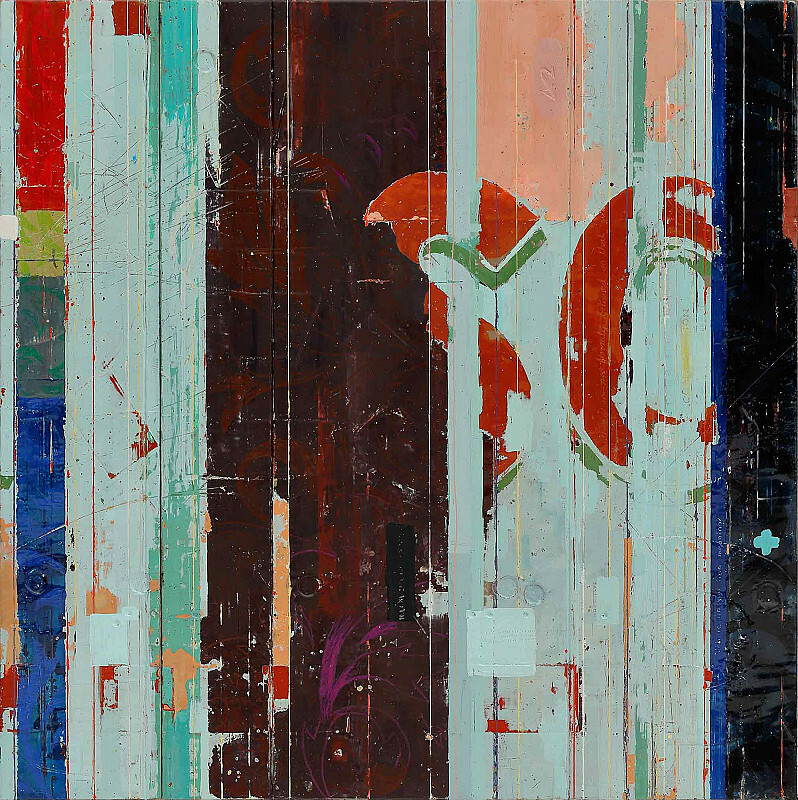 His works merge the additive process of painting with the subtractive process of sculpture. The overall thrust of his current work is the exploration of the shared myths of our society.